Microsoft first got serious about digital inking in Windows 10 a year after the operating shipped. The software maker added Windows Ink in the aptly named Anniversary Update to improve stylus support for devices with a pen. Windows Ink was a good first step, and Microsoft has been gradually improving its inking across Windows 10 ever since. 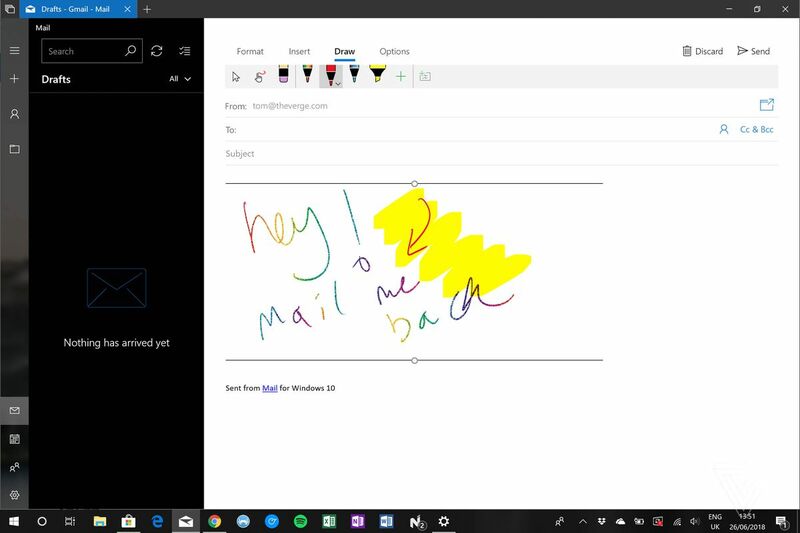 Microsoft is now finally bringing stylus support to the Mail app in Windows 10. Windows Insiders can test the latest Mail app update, and it includes a new draw tab in the ribbon interface when you compose a new email. You can now write an entire email with a stylus if you like, and it’s something that has been strangely absent from Windows 10 for three years now. There are plenty of pen options and colors with this new feature, and it should ship in time for Microsoft’s next major Windows 10 update, currently codenamed Redstone 5. Microsoft is expected to make this update available in September, and the company is getting close to finalizing its feature set. The addition of inking support in the Mail app and SwiftKey for Windows 10 could come at an important time for Windows 10 and its future on new dual-screen devices. Microsoft is currently developing clever modes for clever hardware with Windows 10, and the company is widely expected to unveil a special Surface notepad-like device soon. References to the device, codenamed Andromeda, have been spotted a number of times in the Redstone 5 update, and Intel is preparing to support device makers to create a variety of similar dual-screen devices. These dual-screen devices will likely focus on stylus input to serve as notepads, and Dell is even reportedly working on its own dual-screen devices, alongside Lenovo and Asus.